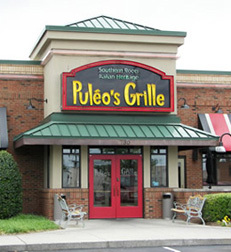 Puleo's Grille offers a taste of fresh steaks and seafood with a flair of authentic Italian cuisine and a hint of East Tennessee and Southern cooking. For a great appetizer, Puleo's Spinach & Artichoke Con Casa is superb. Other menu items include burgers and sandwiches, premium cut steaks, ribs, chops, chicken, seafood, Italian specialties, and sides. Southern Comforts offered are chicken pot pie, roasted pork loin, chicken tender platter, roasted turkey breast, country fried steak or chicken, chopped steak, shrimp and grits, and fish and chips. Puleo's is a good place to eat if you want to enjoy conversation during your meal. The service is consistently excellent; however, if you are going solo, your server will rush you.